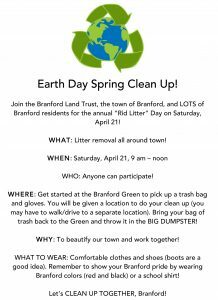 Join the Branford Land Trust, the town of Branford, and LOTS of Branford residents for the annual “Rid Litter” Day on Saturday, April 21! WHAT: Litter removal all around town! WHERE: Get started at the Branford Green to pick up a trash bag and gloves. You will be given a location to do your clean up (you may have to walk/drive to a separate location). Bring your bag of trash back to the Green and throw it in the BIG DUMPSTER! WHY: To beautify our town and work together! Branford colors (red and black) or a school shirt! Let’s CLEAN UP TOGETHER, Branford!